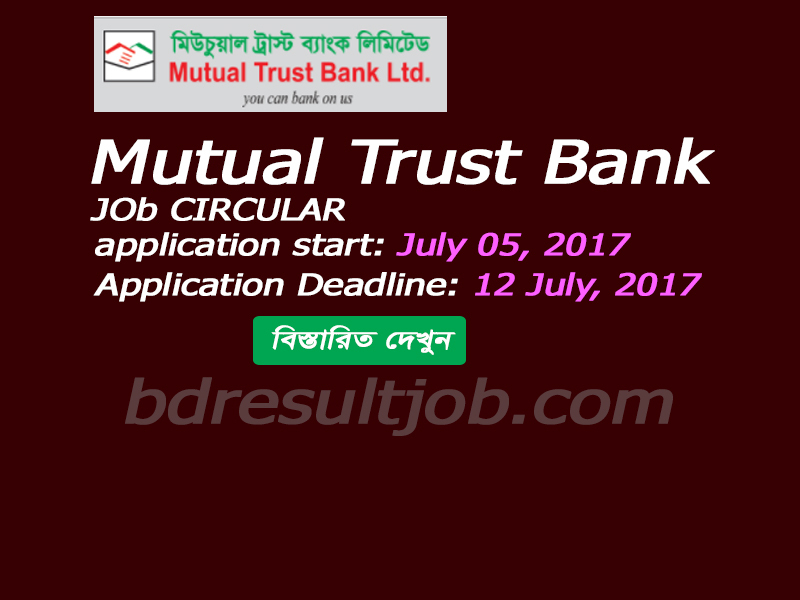 Mutual Trust Bank Ltd. job circular 2017 has been published. Mutual Trust Bank Ltd. is one of the largest private Commercial Bank in Bangladesh. If you want to apply for this job, you should submit your application within 12 July 2017.
a. New Customer Acquisition: New company onboarding, retaining existing portfolio and ensuring sales targets are met through effective management. b. Cross-selling of asset & liability products: Cross sell asset and liability product to new and existing payroll customers. c. Maintain relationship with branches and internal stakeholders : Maintain healthy relationship with branches and stakeholders to ensure flawless services. d. Visit client premises regularly: Visit clients premises regularly to fulfill their financial requirements. e. Process improvement: Work with different cross functional stakeholders to improve process and system automation. f. Risk mitigation: Minimize loans discrepancies/ errors in loan proposal of the payroll clients. Work closely with different channels to ensure that discrepancies and errors are reduced. b. Good sales and negotiation skills. c. Excellent communication and listening skills. d. Ability to explain complex information clearly and simply. f. Understanding and interest in financial / banking products and markets. g. Thorough financial and industry knowledge in order to provide sound and reliable advice to clients. h. Minimum 1 - 2 years of relevant work experience in Banks/ NBFIs. i. Interest in developing relationship with the customers. j. Ability to meet assigned target. 7. Job Location: Chittagong Division, Dhaka Division. a. Driving sales revenue through building a strong channel network. b. Developing Go-to-Market plans for each of the channel partners and ensuring the efficient execution of those plans. c. Building successful real estate developers and auto dealer relationship management to create a favorable platform to penetrate more. d. Managing and maintaining vendor relationship through multiple engagement programs. e. Creating an efficient and effective referral pipelines through the developer and dealer relationship. f. Coordinating work with Risk, Legal & Compliance and other control-related activities and with others within Internal Audit. g. Ensuring proper collection and recovery of loans provided. a. Age 25 to 40 year(s).